At least 85 percent of the universe consists of particles that we cannot see but which must be there according to theory. Researchers from FOM institute Nikhef want to detect this dark matter. They use experiments with liquid xenon for this. Vessels filled with liquid xenon are the basis for the experiments Nikhef is involved in. If dark matter particles collide with xenon, light flashes occur. These light flashes can subsequently be observed with sensitive detectors. The signal provides information about the properties of dark matter. In 2014, the researchers finished constructing the XAMS R&D set-up at Nikhef. The core of the setup is a small detector containing 4 kilos of liquid xenon. There is too much background radiation in the Netherlands to actually find dark matter with this detector but the researchers can use it to study the physical properties of xenon. The device will also allow the development of new detection techniques. The next step up is the XENON100 detector with 160 kilos of liquid xenon. That device is located under the Italian Gran Sasso mountains so that it is shielded from natural background radiation. Up until the end of 2013 this was the most sensitive device in the world for detecting dark matter. Nikhef is analysing data from this experiment. Unfortunately the instrument has not detected any dark matter yet. So the time is ripe for an even bigger device still. The XENON1T experiment is currently under construction. 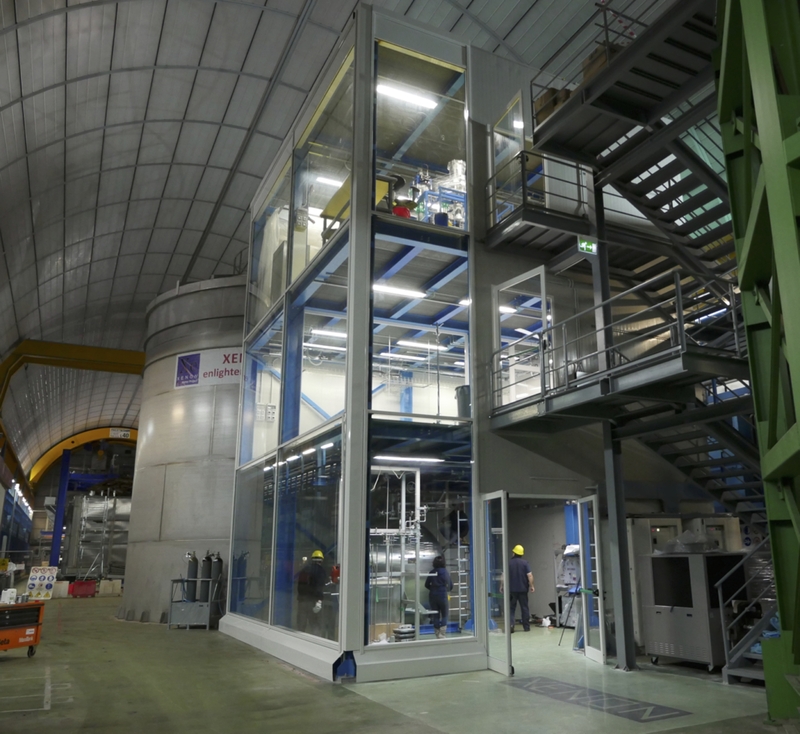 This powerful detector, containing 3500 kilos of xenon, will also be located in Gran Sasso. The device will start to take measurements at the end of 2015 and is one hundred times more sensitive than its predecessor. The researchers from Nikhef will participate in collecting the data. They are also constructing a digital filter that will be even better still at detecting dark matter. Nikhef already delivered the mechanical structure that supports the cryostat containing the liquid xenon in the middle of an enormous tank filled with water.